In this episode, Tommy's over-dependence on others is contrasted with Koji's insistence on going solo. Neither is a factor when they're beating up the bad guys. Once you get past the initial groan of realizing this is going to be a Tommy episode, closer examination will unearth a lot of neat things going on here. It's hard not to describe this as a run-in-the-mill morality/character development episode where someone learns a valuable lesson and becomes a better human being. It is, and as such there are limits as to how much it can wow us. But while Tommy has his little life lesson in Flame Area, there's a seemingly unrelated adventure with Koji that presents several unspoken parallels. Impressive and fun as this whole Sakkakumon concept is, there's a lot of this going on. All five of the digidestined are separated, so emphasis on the individual is inevitable. Today's story of “Tommy meets friend, friend turns out to be enemy, Tommy beats enemy” is predictable and trite, but could have taken up the entire episode if the writers really really wanted it to. They didn't, and they deserve some credit for that. Instead, we get a brief story with Koji that's even more simplistic: “Koji meets enemy, Koji beats enemy.” There is certainly not a whole episode in this. 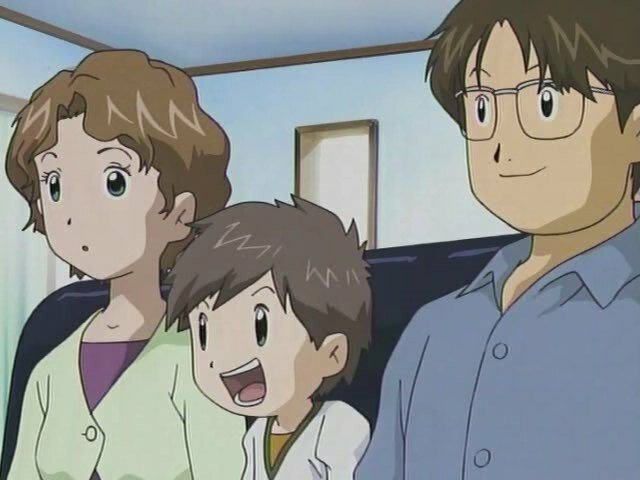 But the cutaways to Karatenmon taunting Koji and Koji's eventual victory serve to punctuate and parallel Tommy's life lesson. For Tommy is learning about the dangers of depending on friends and family too much while Koji is getting an earful about his lack of faith in others. All season long, Tommy has been in a tough predicament where he's young, mostly helpless and physically unable to contribute as much as the others, but unable to be shielded in the way that previous youngsters had been. He's forced to stand up on his own, and that's harder for him by nature. This episode exposes that part of it is by nurture as well, giving him a legitimate character fault to overcome. As it turns out, part of the reason he's so helpless is that his parents dote on him a little too much, accommodating his every need without giving him room to grow. It's nothing tragic, and given his age it's even hard to call it sloppy parenting, but it explains why he's totally unprepared for all this and how he falls into Asuramon's obvious trap. Tommy thinks Asuramon's coddling is par for the course and dismisses his brother's attempt at life coaching as jealousy. Strangely, it's this coddling that probably saves Tommy's life. Used to getting everything and giving nothing back, Tommy is put off by Asuramon's insistence on a quid pro quo relationship, especially when the quo involves taking him someplace up high and murdering him. Tommy tries to do some life coaching of his own, insisting that friendship isn't a zero sum game, but the real lesson here is “killing your friends is bad.” This exposes Asuramon as the enemy that was chasing him at the beginning (big shock there) and Tommy is forced to fend for himself. This is where he realizes on the fly that sometimes he has to do things himself. He does and successfully escapes the funhouse. Therein lies the problem. 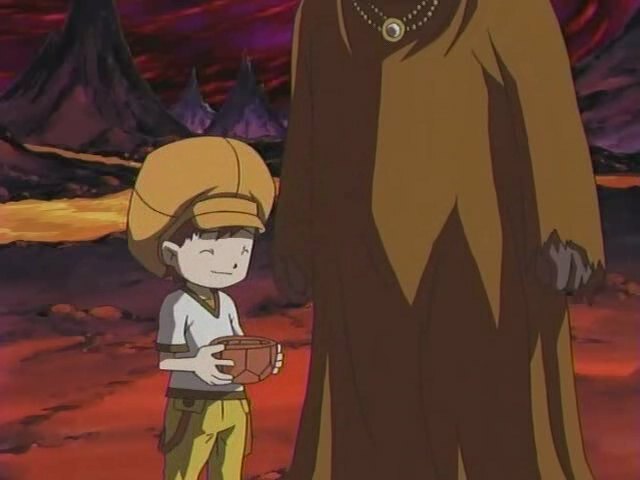 Asuramon tries to take advantage of Tommy being dependent, but his ploy is transparent and revolves around guilting Tommy into a gullible degree of kindness. Turns out there are limits to his gullibility, especially when he can sniff out a bully a mile away. 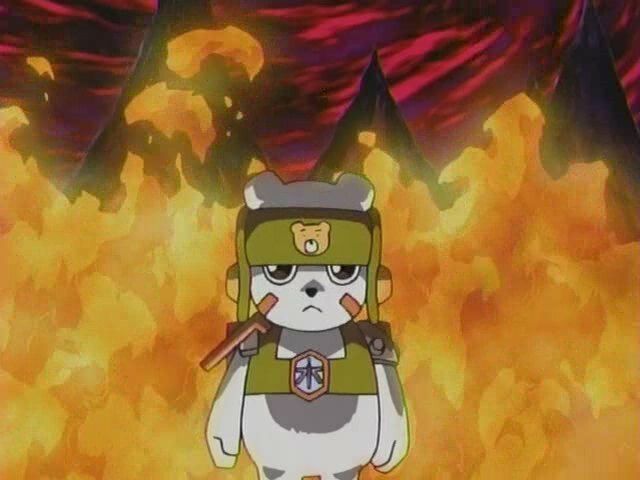 Karatenmon tries to chide Koji for not having faith in friends, ignoring that Koji is a total badass and is more than capable of taking care of his own business. It's nice that Tommy learned a lesson, but it's not like either his or Koji's faults were responsible for endangering them in the first place. Better Know A Sephirah! The Flame Area is Binah, which represents understanding. While the top right sphere is a sort of divine wisdom, the top left here is rationality and common sense. Tommy figuring out what his brother has been trying to tell him fits well here. As for Koji, he's in the Wind Area Hod. It represents majesty and, to borrow a page from the landscape, seeing the forest from the trees. In order to get stronger, Koji needs to learn to rely on his friends. Someone has to tell him that first. One moment Zoe's pissed at Takuya and JP for getting too touchy-feely and now she's shocked that the boys would abandon a girl alone. While Karatenmon was all bark and no bite, his calling Lobomon “puppy” was a nice touch. The battle between Kumamon and Asuramon is one to behold. There's some fantastic moments in it, such as using ice to break through the edge of the rock and send Asuramon into the lava, but Korikakumon's habit of sitting perfectly still and not doing anything is confusing (originally I thought it was Tommy trying too hard to control his spirit... now I don't know). His backflipping and rapid-fire dodging seems more in line with a speed-based fighter instead of the tank that he probably should be. "A name was needed for Tommy/Tomoki's brother, simply called 'big brother' in the Japanese version. Instead of pulling a Keenan Crier and making one up out of whole cloth, they chose 'Yutaka'. Not only is this an actual Japanese name, it's an anagram of Takuya." I don't think Karatenmon was that ineffective. While he did get curb-stomped by KendoGarurumon, he at least had the clear advantage over Lobomon, and he presumably got the last laugh when Koji left with the guy's words ringing in his ears.